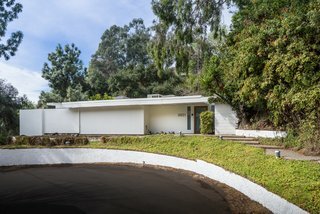 The luminous home of late composer Paul Buckmaster—whose arrangements were instrumental to artists like David Bowie, Elton John, and the Rolling Stones—is on the market in Los Angeles. 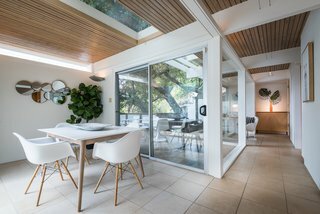 Thought to be the first residence designed by the award-winning, midcentury architecture firm Buff & Hensman, the former home of acclaimed composer Paul Buckmaster is offered at $1,385,000. 2621 La Cuesta Drive is located near Runyon Canyon hiking trails. 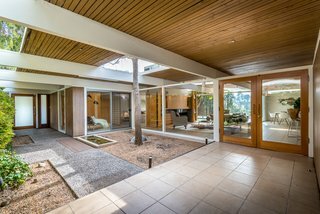 Architects Conrad Buff, Donald Hensman, and their associates were known for designing hundreds of post-and-beam, wood-and-glass residences in post-war California that were ahead of their time in terms of layout and aesthetics. From 1950 to 2000, their firm created everything from economically built cabins to lavish celebrity homes, winning over 40 American Institute of Architects awards along the way. The home exemplifies the indoor/outdoor lifestyle of Southern California. 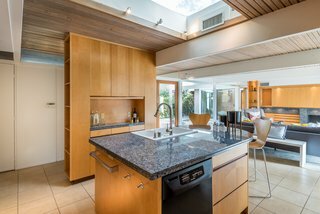 Buff & Hensman homes are beautifully proportioned, delicately balancing mass and shadow. Making use of structural planes like baffles, and large glass panels, these dwellings are often open and airy, yet private and intimate. 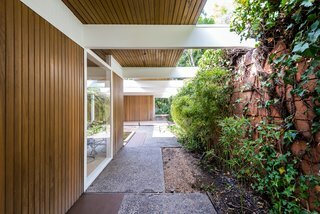 The living room feeds into a courtyard with a water feature. 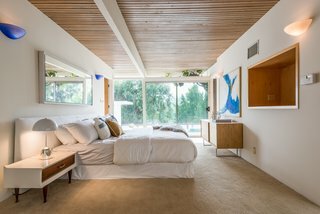 L.A. architect Jonathan Weston remodeled the kitchen and bathrooms, and added a pool, but other than that, much of the house’s distinctly midcentury architectural features remain intact. 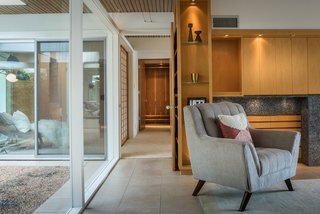 Glass sliding doors allow for interesting interior perspectives. 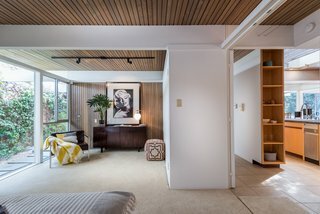 Built in 1957, the 1,530-square-feet, two-bedroom, two-bathroom residence in 2621 La Cuesta Drive on the Sunset Strip is purported to be the very first Buff & Hensman–designed home. A pool and outdoor lounge area enjoys the shade of surrounding trees. Former owner and string arranger Buckmaster, a cello wunderkind, started his career by working with David Bowie on "Space Oddity" and went on to help shape the sounds of the Rolling Stones, Elton John, Harry Nilsson, Carly Simon, and Taylor Swift over the next 50-some years. 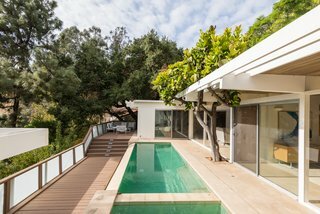 He purchased the residence in 1998 and hired L.A. architect Jonathan Weston to update it. A bedroom looks out to canyon views. 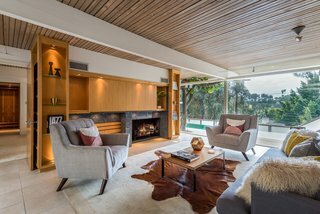 Characterized by clean lines, classic midcentury materials and finishings, and expansive glass walls, the house also features cantilevered overhangs and an open floor plan that accommodates a variety of flexible living spaces. 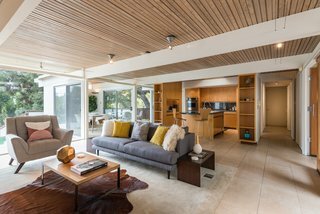 The Southern Californian Buff & Hensman–designed home boasts clean, midcentury lines. Christina Kretschmer is responsible for the staging of the property that’s now available for sale through Pacific Union International. To find out more, contact Richard Stearns or Carrie Berkman Lewis. The archetypal Buff & Hensman home is characterized by both open and intimate spaces. 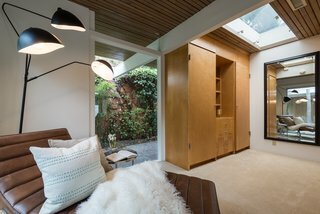 Skylights enhance the indoor/outdoor feel.